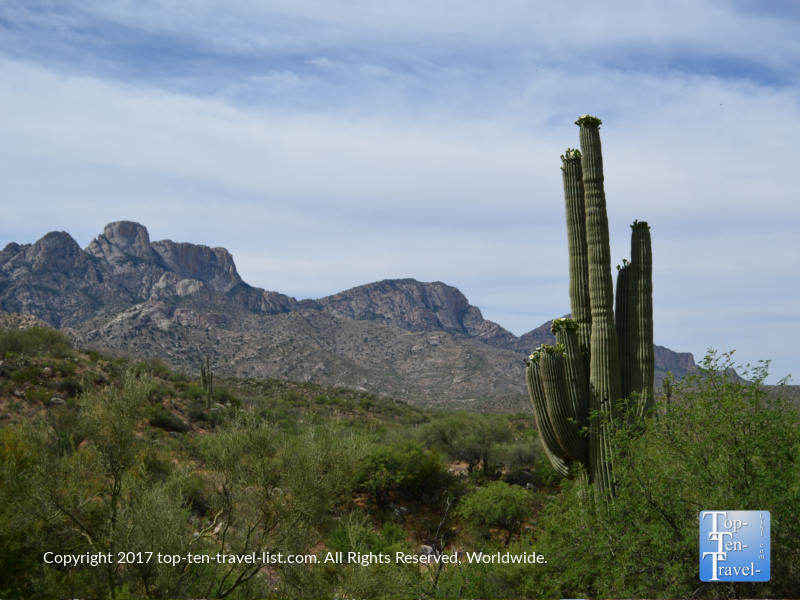 Hiking Hotspot: Beautiful Catalina State Park in Tucson, Arizona - Top Ten Travel Blog | Our experiences traveling throughout the US. 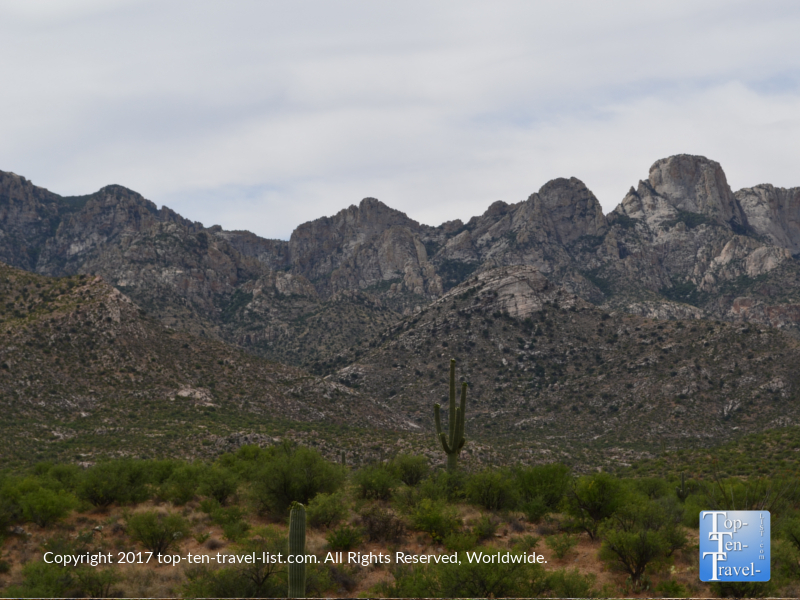 For an incredible desert hiking experience with endless views of cacti and stunning mountain vistas, plan for a hike at Catalina State Park, Tucson’s most gorgeous hiking area at the base of the dramatic Santa Catalina mountains. 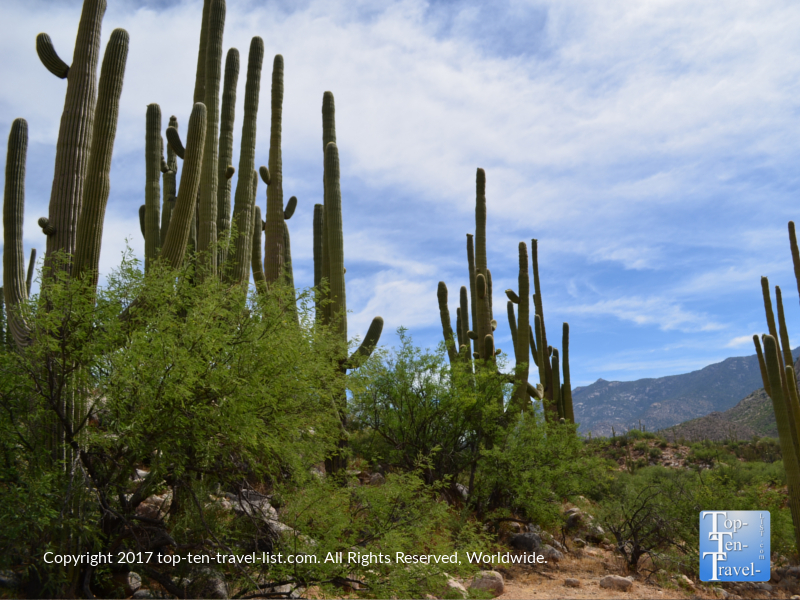 If you love the amazing Saguaro cactus, then Catalina is definitely the place for you as over 5000 of these fascinating desert plants can be found throughout the park. 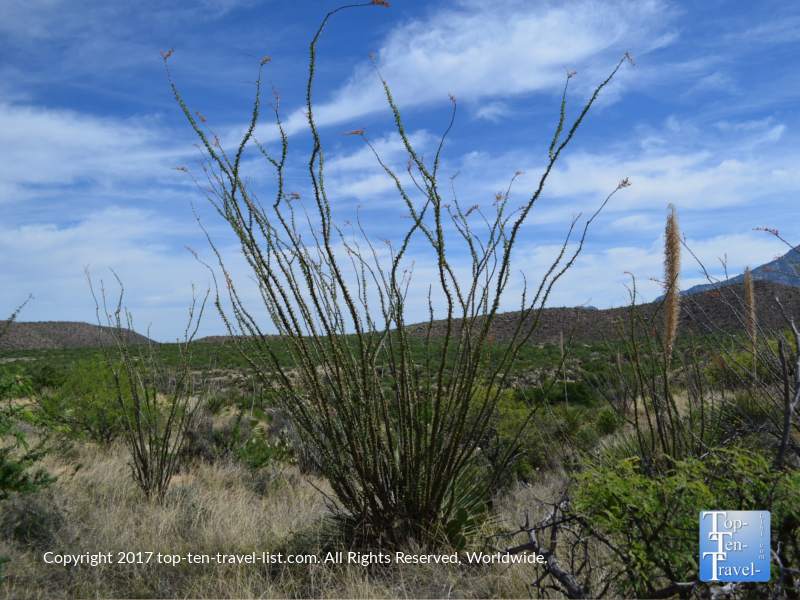 Located with the Coronado National Forest at an elevation of 3000 feet, the park offers a more lush variety of plant life & lots of opportunities for bird watching (more than 150 species of bird call Catalina home), which makes it the prime place for a scenic hike in Tucson. 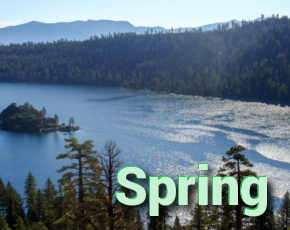 Wildflower season (March) is a great time to visit as gorgeous flowers overtake the park, not to mention this is one of the best months weather wise for a gorgeous morning hike. 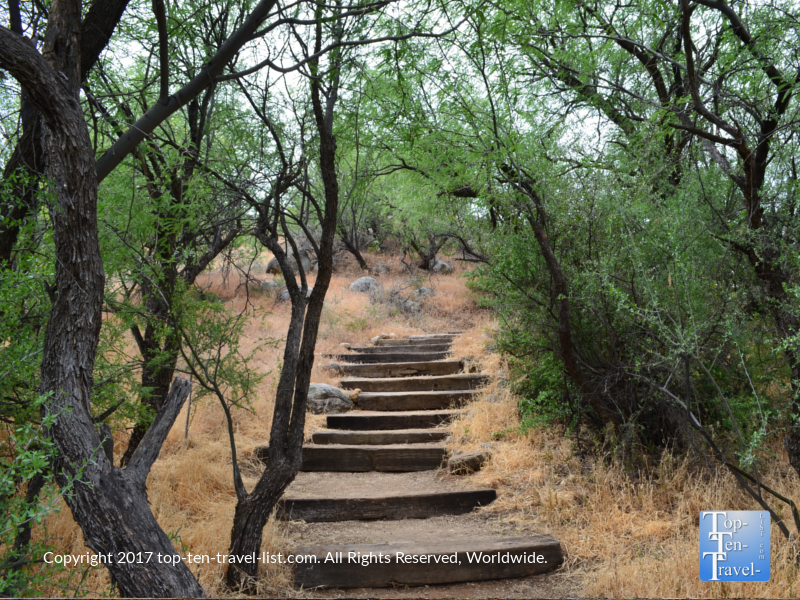 Hiking, biking, equestrian, and nature trails can all be found at Catalina, so basically there is some type of fitness activity for everyone. 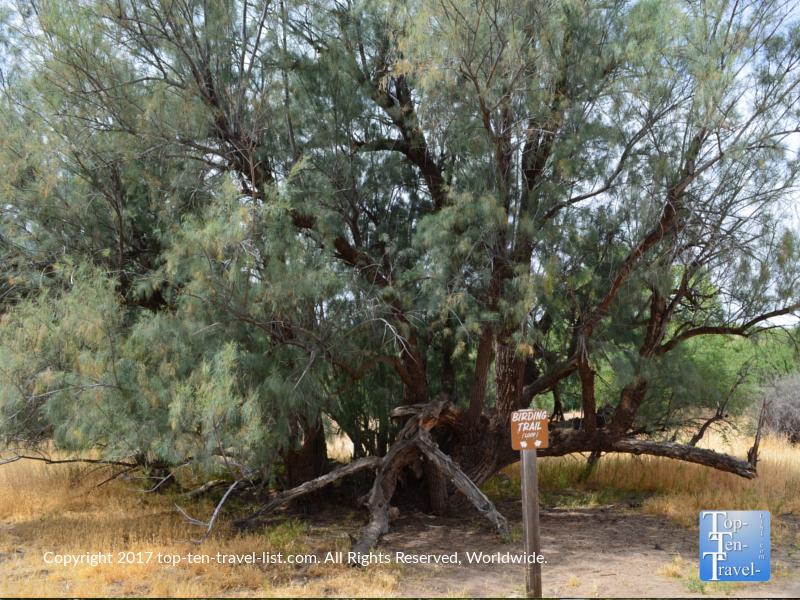 Trails range from super easy (under a mile) to extremely intense (8+ miles), so whether you are looking for an easy stroll in nature or an all day adventure in the desert, you will find it here. 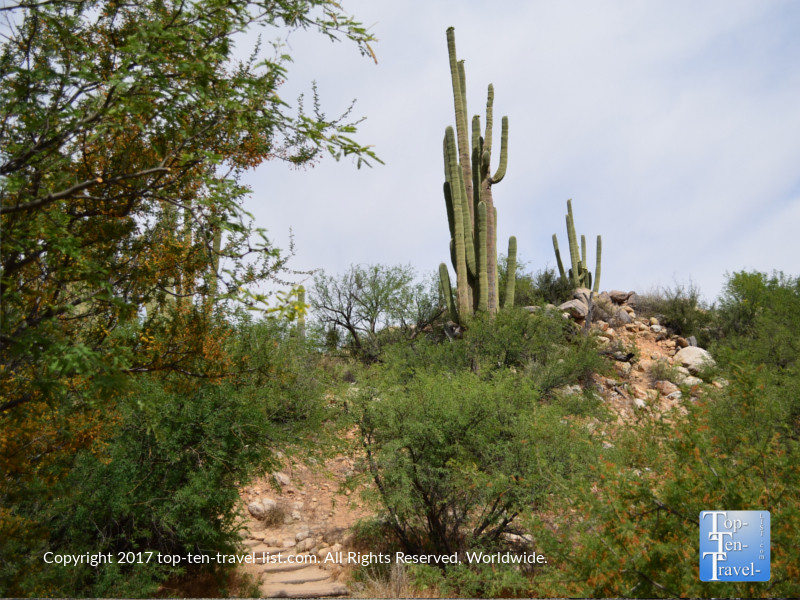 The Catalina Loop Trail is a nice beginning trail for just about anyone as it is just 2.3 miles total and pretty easy in terms of flatness with just a few small hills. 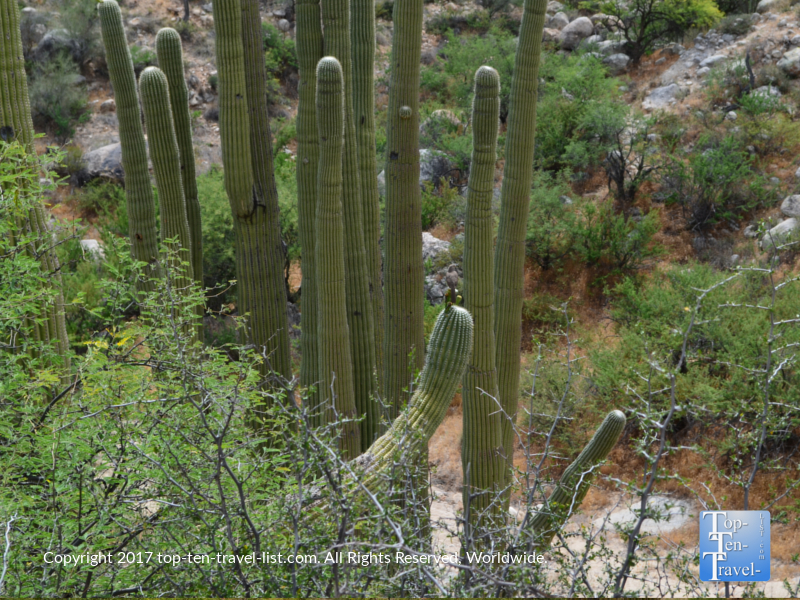 Along the way, you will enjoy endless views of the beautiful Saguaro. 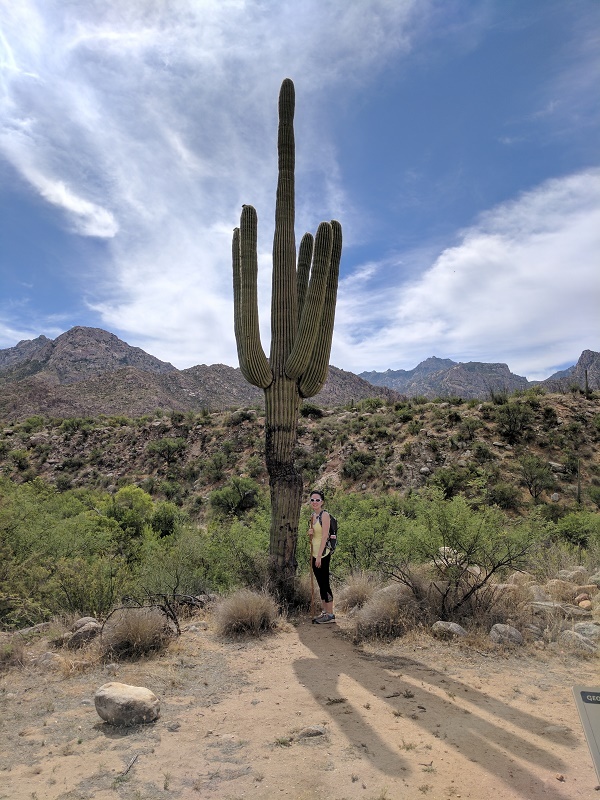 Lots of opportunities to get your picture next to a giant cactus! For an escape from the Tucson commercialization, you really cannot get much better than Catalina. 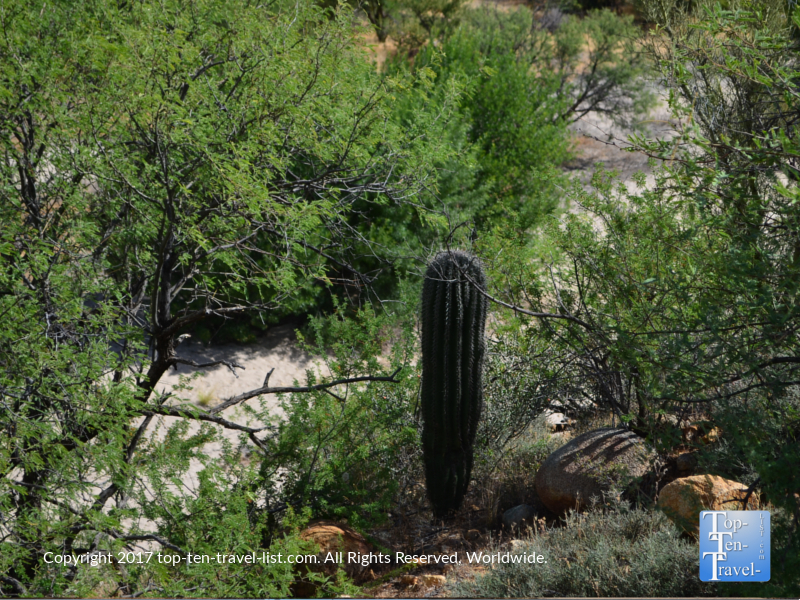 The hiking trails are well maintained and well-marked (many in the Tucson area are poorly marked! 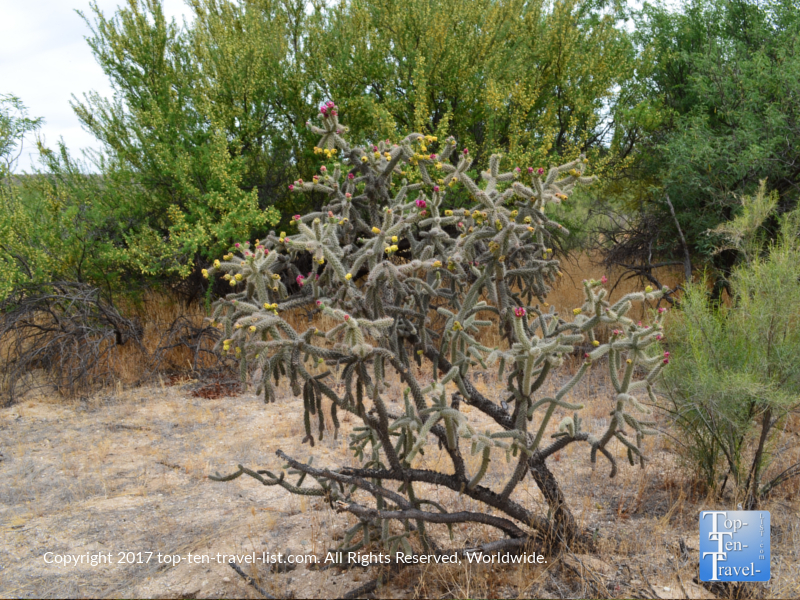 ), the trails are peaceful and never overly crowded, the mountain views are amongst the best in the area, and the diverse desert plant life is truly spectacular. Do yourself a favor and get out there and explore the wonder of the desert. 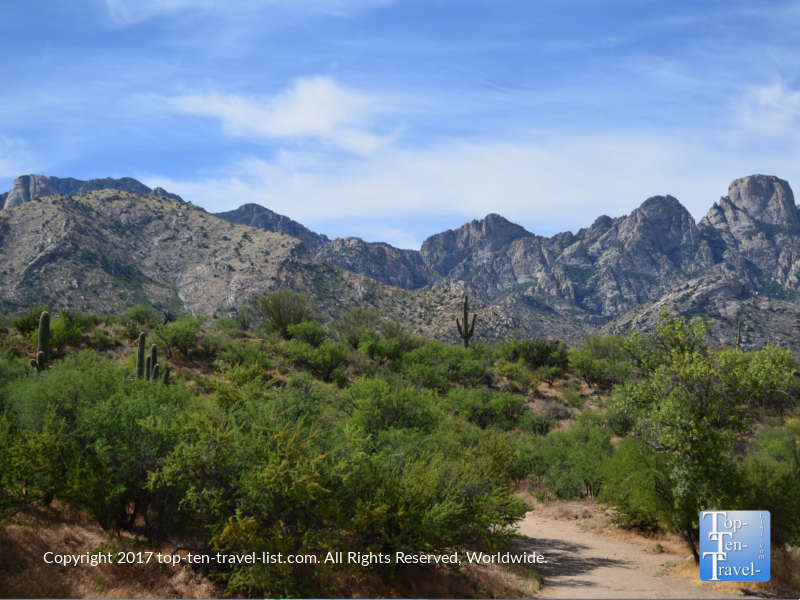 The entire Tucson area seems to be comprised of never ending businesses and franchised chains, so you will have to get out there on the trails to see some of the natural beauty. 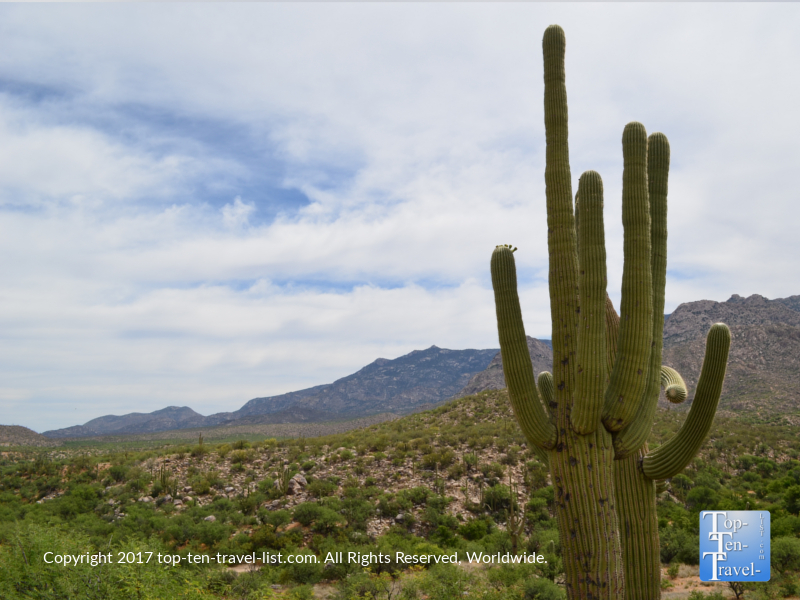 However, it is worth the effort to see the unusual Saguaro cactus, which is found exclusively in Southern Arizona’s Sonoran Desert. Enjoy some photos from the trail! 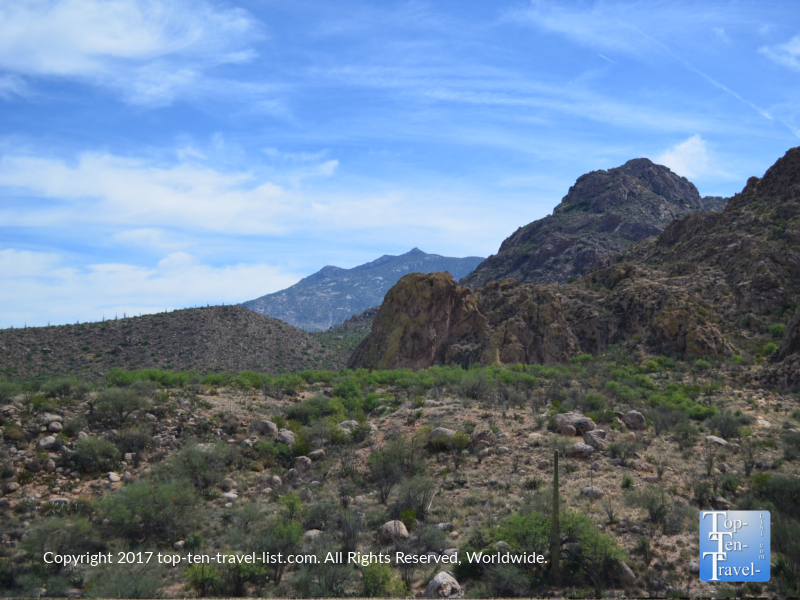 Notice the diverse variety of plant life & beautiful mountain views! Avoid visiting Catalina at all costs during the brutal summer season! Temps frequently soar above 105, and adding in the relentless sun, it is just too hot! Many die each year on the trails due to heat exhaustion and/or dehydration. Save hiking for the milder fall and winter seasons. Bring more water than you are used to. A regular single bottle of water will not cut it in the desert. Dehydration is a major concern so be prepared. Wear a camelbak or stuff a backpack with multiple water bottles. I also bring a bottle of water for dumping over my head. Wear sunglasses and a hat. Even if the temps are in the 70’s, the sun is absolutely brutal the entire year. To avoid a miserable hike, be prepared. Sunblock also comes in handy. 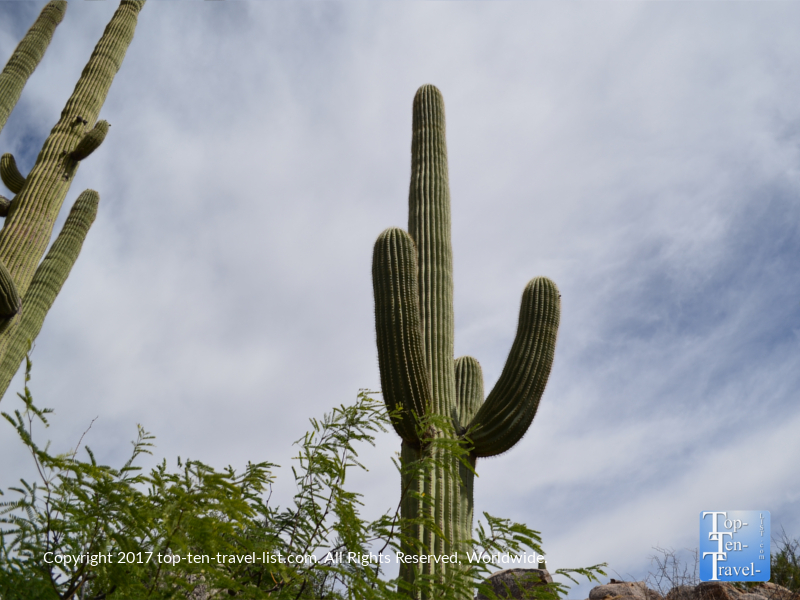 Do not get too close to the cacti. From personal experience, I can tell you that it is not a pleasant experience to remove cactus needles. The pain last for several hours afterwards! Keep the distance short. If you are not used to desert hiking condition, it is essential that you keep your hike shorter than usual. The dry conditions and intense sunshine make even the simplest hike seem that much harder. Take advantage of the many picknicking areas. Save yourself some money and enjoy a nice little lunch in nature as opposed to a pricey restaurant. Stop for your morning coffee at Savaya. Savaya, a great local roaster, has a location right down the street from the park. 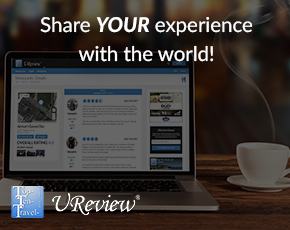 The coffee is delicious and the relaxed outdoor seating area features great views of the mountains. 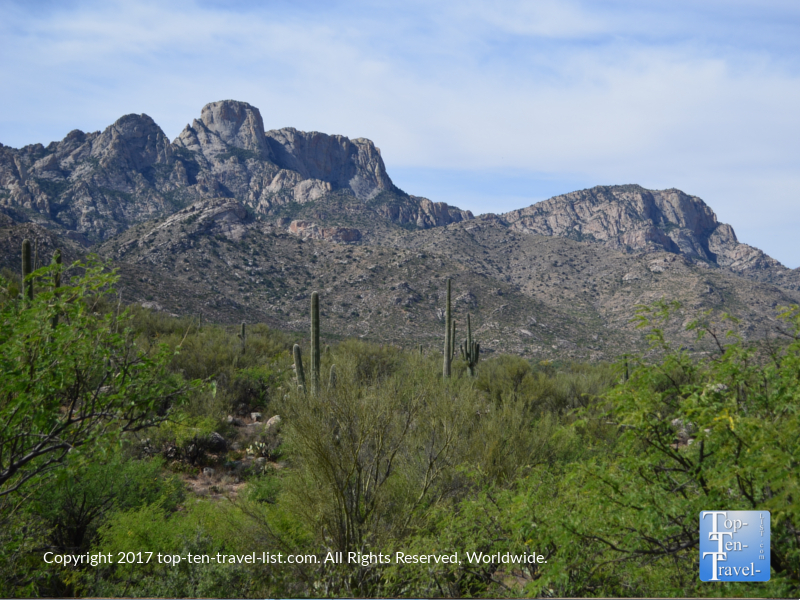 Catalina State Park is located at 11570 N Oracle Rd, Tucson, AZ 85737. Entrance fees are $7 per car or $3 per individual/cyclist. Hours are 5am-10pm. Check the calendar for special events.